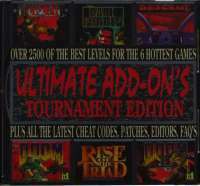 A variety pack CD of shareware editions, utilities and add-on levels for six DOS-era 3D shooters. There's 40+ levels for Star Wars: Dark Forces, 75+ for Descent, 1200+ for Doom, 800+ for Doom II, 300+ for Heretic, and 50+ for Rise of the Triad. It has over 2500 levels plus all the latest cheat codes, patches, editors, FAQs. It has an easy to use interface which will lead and run every add-on level with a click of the mouse.